Yes, says Claudia Myatt, "being an artist" is a way of viewing the world. Claudia is a marine artist who lives on a Dutch tug and has her studio in a boatyard. She provides illustrations for yachting magazines, drew a major series of instructional books for the RYA (Royal Yachting Association) and it was a happy day for me when she agreed to be the illustrator for my Strong Winds stories. Because I do not think that anyone can draw boats. In fact I think most people can’t. Not boats in action; boats responding to the pressures of the wind and the resistance of the water; boats at the centre of a complex interplay of forces determined by the shape of their hulls, the set of their sails, the skills of the sailor. 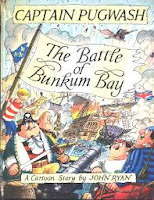 One of the children’s books I most enjoyed, years ago, was John Ryan’s The Battle of Bunkum Bay when lovable idiot Captain Pugwash conceived a master plan of sailing into the bay between the English and French fleets (to collect the treasure of course) protected by a double-sided flag. His theory was that the English would see the English flag and think his 'Black Pig' was one of their vessels and the French would assume the same. Pugwash forgot, however, that when he was sailing out of Bunkum Bay – with the wind behind him – his flag would blow out ahead of his ship, with precisely, disastrously, the opposite effect. Most of the cheery author-illustrators who churn out stories for the pirate market would never even realise this was an issue, let alone have the confidence to use it as a plot device. So what about this “Anyone can be an artist” theory – is it just a phrase for Claudia Myatt to encourage her students? Keeping a Sketchbook Diary was conceived in the Crow’s Nest bar of the P&O cruise liner Aurora, as she crossed the Pacific in January and February this year. No, this was not the result of some over-enthusiastic broaching of the rum barrel, nor a madness of the equatorial sun, Claudia had been allocated Crow's Nest as a teaching space for the forty or fifty students who were attending each of her twice daily watercolour painting classes. She was also writing blogs for her friends at home. 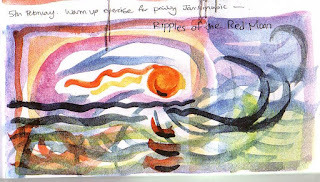 I read one aloud to my mother as we sat on her sofa in Suffolk with the short January day already drawing in. Since last writing, I’ve crossed the equator and the date line. I’ve visited Maui, Honolulu, American Samoa and Western Samoa, and we’ve just docked at Auckland, New Zealand. During the last weeks I have taught classes on colour mixing, perspective, the joys of sketching, the importance of letting the paint dry between washes, and I’ve impressed on all my students that being an artist, at any level, is a one way ticket from which there is no going back. Even if they never want to take it further, they will from now on see everything around them as colour, shape and line, and their lives will be enriched by the process. One of the reasons I was reading to Mum was to try and avert the dreaded 'sundowners' syndrome. In the evenings, this winter in particular, Mum has become disorientated, agitated, angry or afraid. One of the phenomena about which she complains is that “they keep changing everything”. I usually tend to focus on the word “they” – the classic pronoun of the oppressed and powerless (think of the chapter on Them and Us in Richard Hoggart’s The Uses of Literacy) – but often, when we’re sitting on the sofa, looking out of the window I’m trying to supply Mum with words, such as “fence”, “lawn”, “roof” and “chimney” for the objects in our view. Today, thinking about what Claudia had written in her blog, I realised that, once you had lost the names for these things, the meanings were also in danger. Once meanings had gone, “fence”, “lawn”, “roof” and “chimney”were merely a collection of different shapes. And, as the light dimmed, their proportions relative to one another changed, as well as their colours. The brown creosoted fence in particular appeared to advance menacingly as the last of the light retreated from the strip of grass in front of it. When I thought a little more about the phenomenon of shadows I was not in the least surprised that Mum was also seeing “spooks”. One might want to pause and have a debate about this: what about the auditory element in words, one might say, or the visual impact of light and colour? 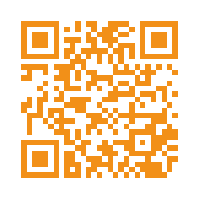 Line is but a single aspect. Claudia throws out hints about using colour as a response to music or drawing the shapes of emotions. There is clearly a bigger book to follow. 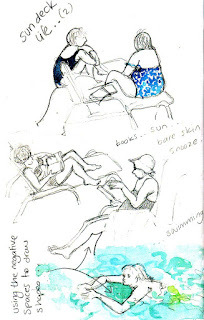 Meanwhile those of us whose chosen medium is words, could learn a great deal from the practical tips offered in Keeping a Sketchbook Diary to those who do their “thinking with a pencil”. 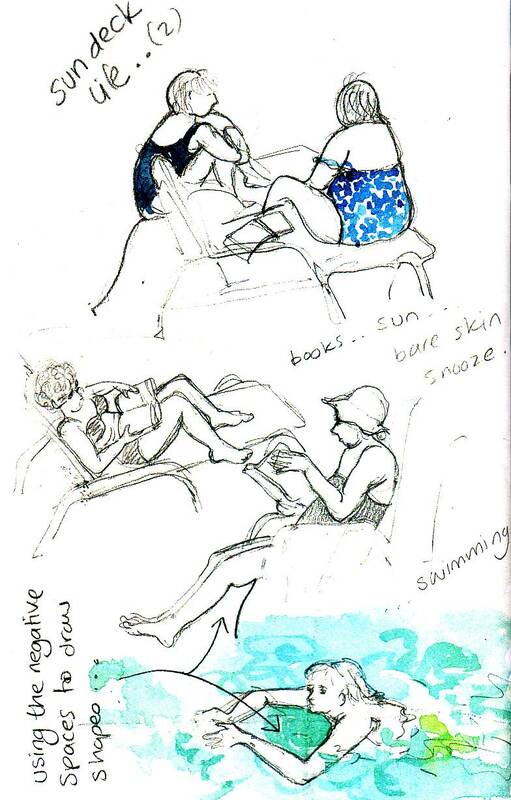 I noticed Claudia's advice to make the most of the “negative spaces” in a drawing, immediately before I listened to a BBC radio programme about the silences in Shakespeare. Her advice to challenge your perceptions by drawing small things big, as well as squashing entire scenes onto a single A4 sheet, would make an equally useful exercise in a creative writing class. “To draw something you have to look at it as if you have never seen it before, because what you are aiming to record is what is actually there, not what you assume you are seeing – there is a big difference. Even the act of trying to draw connects to an experience in a way that is memorable and intense”. Follow that advice and you would, in some sense, draw the boat right -- whether or not you had any understanding of the effects of underwater hull design -- because you would be looking with a clear, unprejudiced eye. That’s how I feel, as a writer, when I am trying to find the words and the rhythms to convey precisely what is in my mind. Anyone can be an artist if they develop an artist's approach to the world – and anyone can be a writer too. 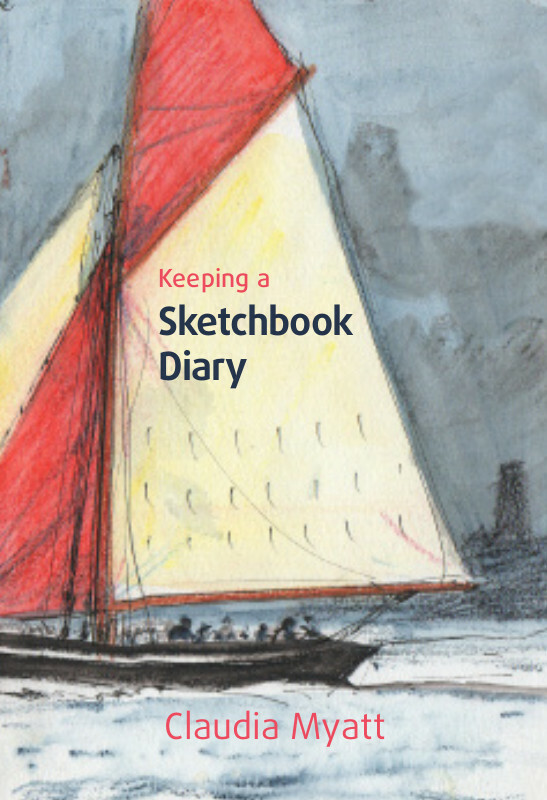 As for me, I’m proud to be the publisher of Keeping a Sketchbook Diary and I commend it to you. 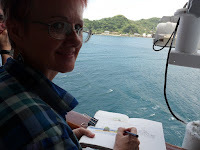 Sailing, writing, sketching - three of my favourite activities (although my total lack of skill at one of them calls into question the validity of Claudia's claim). A lovely post, Julia and, as ever, the analysis of your perceptions of what your Mum is going through reveals so much about us all. A wonderful post, Julia. It works at so many levels. A new writer I mentor, Roz Austin, now doing a PhD, did a marvellous project with her now-dead grandmother who had Alzheimers, getting her to retrieve memories through poetry. The results were not only moving but satisfying works in their own right. And one of their functions was to be a last defence against this very losing of the names of things which you mention. Commenting late after being abroad, another brilliantly moving post Julia, and very thought-provoking on language and whether/how much it defines what we know and experience. I'm reminded of Alan Bennett's mother who had dementia, pointing out some sheep and saying, 'I've forgotten what they're called, but I know what they are' or similar, and he notes in his diary 'thus Wittgenstein is routed by my mother' as W had said the limits of our language are the limits of our world. This state of affairs, which his mother was still able to articulate, may be true of those with forms of dementia far more than we realise, which is why I'm a fan of giving benefit of the doubt about them 'knowing' things. I'm a fan of Claudia Myatt's work already and the two of you make a great team, so I'm delighted you're publishing her. Thank you so much Julia - you have woven a thread of fine perceptions and connections as always. 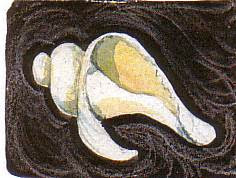 Interesting that you should pick up on what Ruskin called 'The innocence of the eye' - the ability to see things as pure shape, tone and colour. We lose this ability as we grow and learn, but dementia is a process of unlearning, so it must be very bewildering when the innocence of the eye turns up unasked and unfamiliar. How wonderful that you have made the connection between alzheimers and art, Julia. I was aware that as words disappear for a sufferer, so do does the whole concept behind that word. But I hadn't made the extension that so too does the concept behind a shape. Those nail biting copy-editing days.